Will Trump sign new sanctions bill? President Trump has signed a sweeping sanctions measure that targets Russia, Iran and North Korea, the White House said in a statement Wednesday. 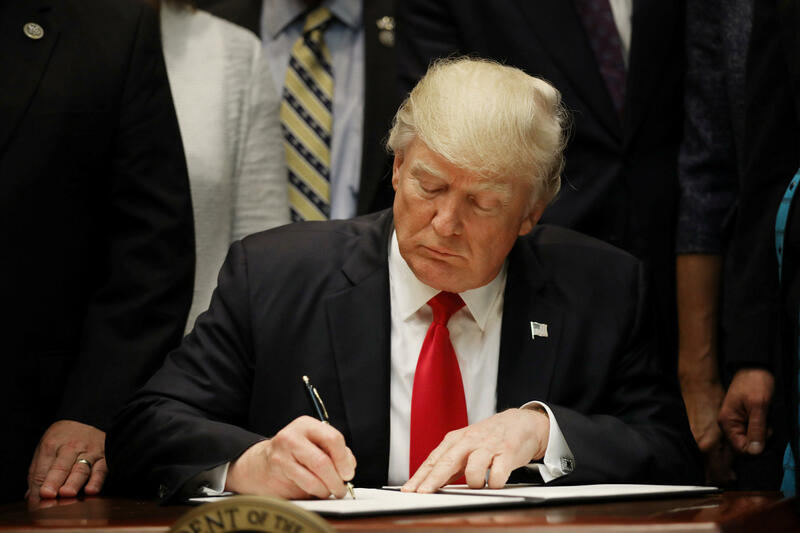 The president's signature comes after some speculation that he could veto or not sign the legislation, which passed both chambers of Congress in overwhelming votes last week. Vice President Mike Pence and other White House officials had signaled, however, that Mr. Trump planned to sign the bill into law. While he signed the bill, the president made clear in a statement Wednesday that he's signing the bill "for the sake of national unity" even though he isn't satisfied with some of its provisions. "I favor tough measures to punish and deter bad behavior by the rogue regimes in Tehran and Pyongyang. I also support making clear that America will not tolerate interference in our democratic process, and that we will side with our allies and friends against Russian subversion and destabilization," he said. He added, "Still, the bill remains seriously flawed – particularly because it encroaches on the executive branch's authority to negotiate." The bill maintains and expands sanctions against the Russian government. Most importantly, it will require congressional approval before the president can ease or lift sanctions on Russia. The measure also targets sanctions on Russian activities that undermine U.S. cybersecurity, sanctions on Russian crude oil projects and on certain transactions with foreign sanctions evaders and human rights abusers, among other things. A day after the Senate passed the new set of sanctions, Russia's Foreign Ministry last Friday announced countermeasures in which it set a Sept. 1 deadline for Washington to reduce the number of diplomatic staff in the country and ordered some U.S.-run facilities in Russia to close. Mr. Trump's signature is significant given that he spent time on the 2016 campaign trail promoting a platform that included a warming of relations with Russia and its president, Vladimir Putin. The two leaders met in person for the first time in early July at the G20 summit in Hamburg, Germany. Mr. Trump later came under fire for a previously undisclosed conversation that he had with Putin at the time over dinner in which only a Russian interpreter was present. The measure also targets Iran's ballistic missile program, its support for terrorism and human rights violations, and yet it would still comply with the Iranian nuclear deal. Specifically, it imposes sanctions on any foreign person or foreign entity that does business with an entity already designated by the administration that has a connection to Iran's ballistic missile program. These sanctions, for example, could apply to any financial institution or any foreign company that provides key parts or components to Iran's missile program. As for North Korea, it enforces compliance with United Nations shipping sanctions against North Korea and it imposes new sanctions in response to human rights abuses by the North Korean government and its bellicose behavior abroad. The bill came together in July after a series of road bumps that lawmakers encountered over the last several months. This also comes a day after the Senate confirmed Christopher Wray to serve as FBI director, replacing James Comey, who Mr. Trump abruptly fired in early May. Special Counsel Bob Mueller then took over the federal investigation into Russian efforts to influence the 2016 election, which is still underway. The U.S. intelligence community concluded in a report in early January that Putin ordered a campaign involving covert intelligence operations and overt propaganda to undermine faith in the U.S. election, disparage Hillary Clinton and help Mr. Trump's election chances.